I don't drink coffee, never have. I don't support Starbucks, never will. I've got my own little hot tea habit going on at home. I like flavored teas especially, but not herb tea. Funny, I love to garden with herbs, cook with herbs, just don't make me drink herbs. I love my little Bee House teapot. Every morning I make myself my own personal pot, it's about 2-3 cups. I drink it all, never share. Sometimes I put the teapot on a pretty tole tray, my cup and a bottle of agave nectar and take it upstairs to the computer. I share my Bee House teapot love with friends and family. They make great gifts. You can find a selection of all the colors over at Susan's website, T-Party Antiques. 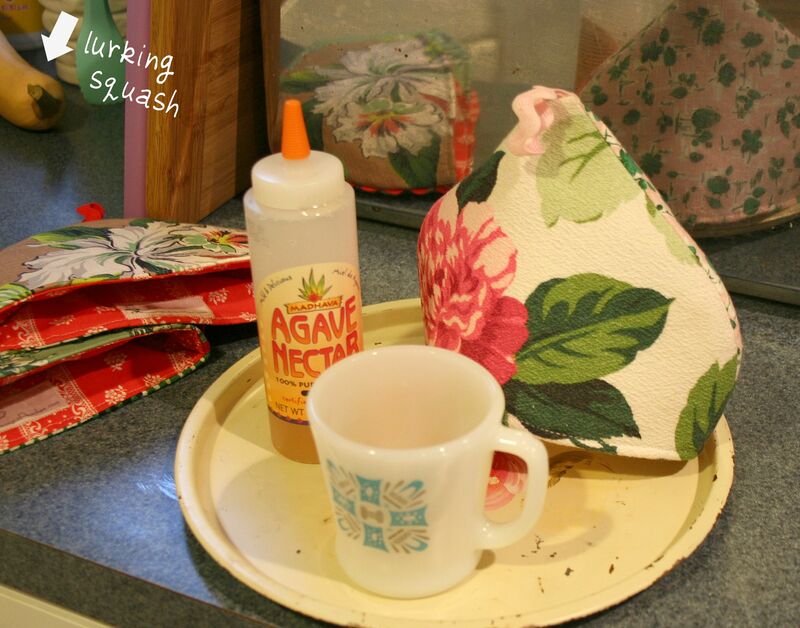 She has the teapots, her own fabulous loose tea blends and pretty little cozies that she has made. Susan can wrap them up and send them out for you. Better service than Amazon I would say! When I send these little pots as gifts I like to include a tea cozy that I have made especially for the recipient from fabric selected just for them. These little cozies are easy to make. You need fabric for the outside and you can see that I like to use different fabrics on the front and back. Pick out something pretty too for the lining. Cut out the 4 pieces (2 outside & 2 lining). I interface the outside fabrics using fusible fleece. You can add a decorative trim before sewing together the outside pieces. Put them right sides together and stitch around the top edge leaving the bottom open. Clip all the curves. Turn right side out. Now stitch together the lining pieces in the same way but down turn. Slip the outside inside the lining, lining up the bottom edges. Pin in place and stitch around the bottom edge, leaving an opening about 3 inches. Turn the outside through, stitch closed and press. It's that easy and quick. I had a lot of comments about the little peeps wreath and several asked how it was made. Uh…. 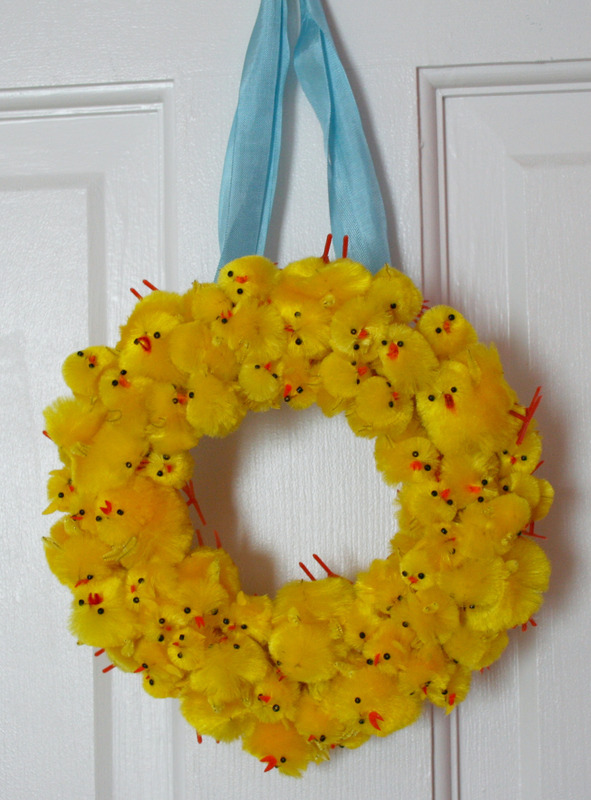 chenille chicks, a wreath form and hot glue. Love your tea cozys. And that chick wreath is too cute! Tea with honey in the afternoon, so soothing! I am a coffee drinker in the morning, but that is it. 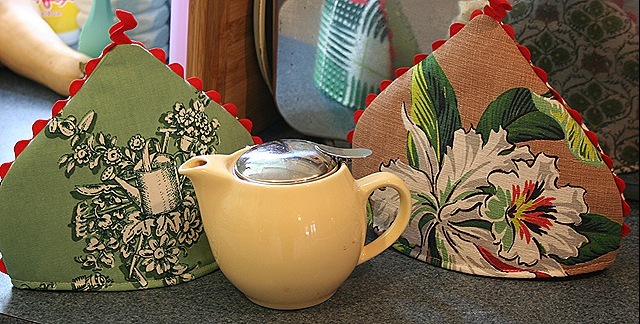 The teapots and cozies as gifts are a wonderful idea, especially because Susan will send them out for you. One of these days we will all have to sit down together for a pot of tea. Tea must be the drink of choice these months 🙂 I have prepared some pretty little sugar hearts on my blog to go with your pretty tea service, in case you switch from agave nectar! I think I need to find myself one of those personal size pots! And a pretty tray. And a cozy! haha. Basically, I need it all. What a cute tea cosy. I am like you. I don’t drink coffee or frequent Starbucks. I copied your pattern and I think I must do a little crafting this evening. That baby Chick wreath is the cutest . Well, I’m a coffee girl when it comes to hot beverages. I love cold iced tea though. I WANT to like hot tea. Love all the cute little bags. Just for the record, I’m a serious coffee drinker and I DON’T support Starbucks. I also live in Wisconsin, and don’t drink beer. I’m such a rebel, hah! Hmmm, Lemon Verbena might win you over. It’s pretty, smells good and makes the BEST lemon tea. Used fresh it makes the best iced tea and is lovely for parties. Just in case you’re in the mood for something new. Those little pots are the cutest. They’re wee round shape is the best. I’m going to adapt your cozy pattern for my coffee press, gasp. Hubby was smart and gave me an insulated French Press, but my favorite morning seat is by an icy cold window. Now it’s going to be protected from the least bit of draft. Thank YOU! Wow – that’s a whole lotta peeps on your wreath! I’m a morning coffee/afternoon tea person – trying to drink more green tea these days. I bet it would taste more exciting coming from a pretty teapot. Nice and lovely home accessories. Well, I came to your blog because of OWOH but I think I found a kindred spirit! I actually drink iced tea more than hot tea but I collect tea-for-one’s and so they are small teapots. I printed out your cozy pattern & it might be a bit big but I’ll give it a try. I have a tatting blog and Tuesday’s are tatting tea tuesday. If I can get the cozy made before next Tuesday, I’ll add a link to your blog in my post. Now, I no sooner got back from picking up the cozy pattern from the printer but I see butternut squash soup!!!! IN the crockpot! I just made my first butternut squash soup and I made it in the crockpot from a combination of recipes on the net. As much as I would like to get your friend’s book, I won’t because I’m seriously downsizing, decluttering, whatever you want to call it, but I’ve given away stacks of cookbooks twice now so I’m NOT adding anymore. My soup was soooo delicious and I’m wondering what everyone else puts in theirs now. LOL! I like that wreath too, tho it’s a big disturbing seeing all those little chickies hanging around like that. VBG! Well, you dont have to buy Stephanies cookbook (though I highly recommend it). She has most of her recipes cataloged on her blog. omg..that wreath is too funny (and cute)! 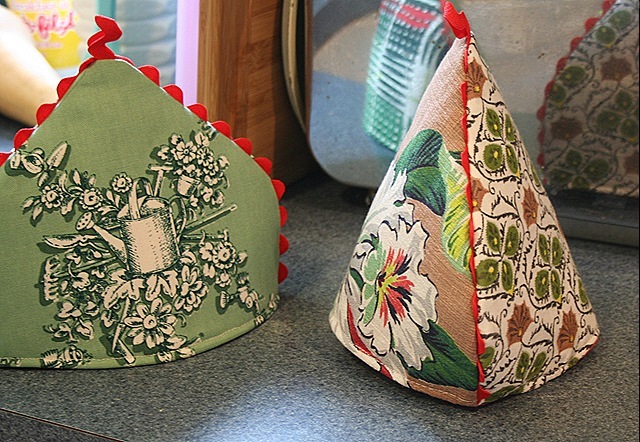 I am inspired by your stylish little tea cozies. My nieces and dil are all avid tea drinkers and will love one for Christmas. Thank you the pattern and inspiring me.